I love visiting New England Felting Supply in Easthampton, MA.! After months of percolating ideas about creating pieces that included large felted areas juxtaposed with silk charmeuse, I went a bit crazy there last week. SO many enticing and varied choices of fibers! I stuck to buying only undyed fiber which helped me focus but I couldn’t resist the potential possibilities of combining various dyed-together fibers and the richly textured felt I might be able to create. Emphasis on “might”. 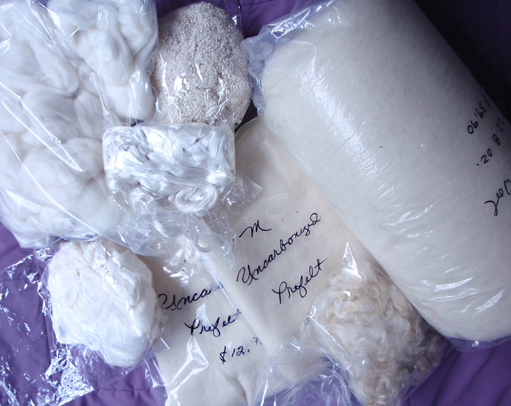 I’m venturing into dyeing and using wet felt methods combining pre-felt, bat, silk fibers and possibly cotton cording. I will most likely need to expect a few disasters initially. First dye session on Sunday with my amazing fiber buddy, Kris. This entry was posted on January 15, 2013 at 1:42 pm and is filed under Artwork, Dyeing, Process. You can follow any responses to this entry through the RSS 2.0 feed. You can leave a response, or trackback from your own site.